New York City's Broadway Theater Reviews and Listings: Broadway Plays and Musicals in NY. New York Broadway Theatre: Times Square pictures, photos, & Tony Award Winners. New York City Broadway Plays, Broadway Shows, Broadway Reviews, and Musicals: 42nd Street, A Day In The Death Of Joe Egg, A Year With Frog And Toad, Aida, As Long As We Both Shall Laugh, Beauty and the Beast, The Boy From Oz, Cabaret, and Chicago. Broadway listings and reviews are updated weekly, Subscribe Here. Ford Center, 213 West 42nd Street between Broadway and Eighth Avenue; 212-307-4100. $26-$100. Mon-Sat 8 PM; Wed, Sat 2 PM; Sun 3 PM; 2 Hours 40 Minutes; Not all Mondays, not all Sundays; Please call in advance as with all Broadway Shows. A new production of the 1980 musical comedy (1981 TONY Best Musical). If you can only see one Broadway show in the next few years, see this one! It's beautiful, flawless, spectacular and provides the razzle dazzle you hope for and much more! This show sets a new standard for Broadway productions and talent. Kate Levering will sing and dance her way into your heart and leave you with unforgettable memories. Taking place in 1933, it contains a superb show chorus and remarkable tap dancing. Based on a novel by Branford Ropes. Lyrics, Al Dubin; Music, Harry Warren; Book: Michael Stewart and Mark Bramble; Director: Mark Bramble; Choreographer: Randy Skinner; Dance: Gower Champion; Starring Michael Cumpsty, Christine Ebersole, Kate Levering, Mary Testa, David Elder and Jonathan Freeman. "42nd Street" originally opened at the Winter Garden on August 25th, 1980; it ran over 8 years. Gower Champion had choreographed and directed the cast including Jerry Orbach, Wanda Richert, Lee Roy Reams and Tammy Grimes at that time. Won 2001 TONY Award for Best Revival of a Musical. Christine Ebersole won the 2001 TONY Award for Best Performance by a Leading Actress in a Musical. A Day in The Death of Joe Egg, or Joe Egg Previews March 14th Limited Run Opens April 3rd - May 25th 2003. American Airlines Theatre, 227 West 42nd Street between Broadway and 8th Avenue. 212-719-1300; $40-$65; Roundabout Theatre Company presents "A Day in The Death of Joe Egg" by Peter Nichols. Directed by Laurence Boswell. Starring Eddie Izzard as Bri, and Victoria Hamilton as Sheila. Set and costume design by Es Devlin; "Joe Egg" is a story of two parents, Bri and Sheila, and their handicapped child, nicknamed Joe Egg. The child is unable to communicate, so their parents create personalities, conversations, and traits for Joe Egg and this causes tremendous strain on their marriage. "A Day in the Death of Joe Egg" first premiered on Broadway in 1968. In 1985, it had won 2 TONY awards including Best Revival, and a Drama Desk and Outer Critics Circle Awards for Best Revival. This play has two titles, both are correct. Cort Theatre, Tickets 138 West 48th Street between Broadway and 6th Avenue, $25-$90; Wed, Fri, Sat, 7 PM; Wed, Sat 12:30 and 3:30 PM; Sun 3 PM; 90 Minutes, 1 15 Minute Intermission; A new Broadway musical based on the books by Arnold Lobel; Two old friends Frog and Toad go through a year of adventure. A jazzy, charming musical of two unlikely friends. Featuring Mark Linn-Baker, Jay Goede, Frank Vlastnik, Danielle Ferland, Jennifer Gambatese, Book and Lyrics: Willie Reale; Music: Robert Reale; Director: David Petrarca; Choreographer: Daniel Pelzig; Producer: Adrianne Lobel & Bob Boyett. "A Year With Frog And Toad" was originally produced by the Children's Theatre Company in Minneapolis, Minnesota in August 2002. Palace Theater, 1554 Broadway at 47th Street 212-307-4747. $25-$90. Tue-Sat 8 PM; Wed, Sat 2 PM; Sun 3 PM; Music by Elton John and lyrics by Tim Rice. Directed by Robert Falls; Sets & Costumes: Bob Crowley; Choreographer: Wayne Cilento; Story of a love triangle between Aida, an enslaved Nubian Princess, and Amneris, an Egyptian Princess who both love the same soldier, Radames. Book by Linda Woolverton and Robert Falls & David Henry Hwang. American Airlines Theatre, 227 West 42nd Street between Broadway and 8th Avenue; 212-719-1300; $40-$65; Sun and Mon only except March 9,10 and March 16,17; Yakov Smirnoff's comedy has been revamped from his old "Cold-War" style era of fame. Now, his stand-up routine focuses in on the differences between men and women! Lunt-Fontanne Theatre, 205 West 46th St., Between Broadway and 8th Ave. 212-307-4747. $25-$85; Tue-Sat 8 PM; Wed, Sat 2 PM; Sun 1 and 6:30 PM. 2 Hours 30 Minutes; A children's must see. Music by Alan Menken, lyrics by Tim Rice and songs of the late Howard Ashman, choreographed by Matt West, directed by Robert Jess Roth. Imperial Theater, Tickets 249 W. 45th St. between Broadway and 8th Avenue; This new musical about the career of Peter Allen is brought to you by Ben Gannon and Robert Fox. The book is by Martin Sherman; Music and Lyrics: Peter Allen, Carole Bayer Sager, Burt Bacharah, and Dean Pitchford; Director: Phillip Wm McKinley; Choreography: Joey McKneely; Settings: Robin Wagner; Costumes: Ann Hould-Ward; Lighting: Donald Holder; Orchestra: Michael Gibson; Hugh Jackman as "Peter Allen". With Beth Fowler. Studio 54, Tickets 524 W. 54th St. between Broadway and 8th Ave; $25-$95. Mon, Th, Sat 8 PM; Tue 7 PM; Sat 2 PM & 8 PM & Sun 2 PM & 7 PM; Closed Wednesdays; 2 hrs. 30 min. One intermission. Deborah Gibson as Sally Bowles, Neil Patrick Harris as Emcee, Mariette Hartley as Fraulein Schneider, Rick Holmes as Clifford Bradshaw, Jane Summerhays as Fraulein Kost, Peter Benson as Ernst Ludwig, and Tom Bosley as Herr Schultz. '30s Berlin decadence. This musical classic is one of the longest running revivals in Broadway history. 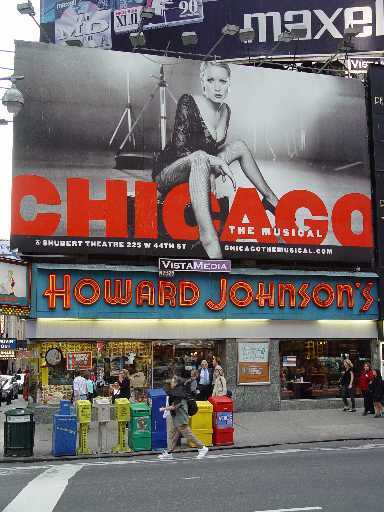 Ambassador Theatre, Tickets 215 West 49th Street between Broadway and 8th Avenue; "Chicago" previously played at the Shubert Theatre until January 26th 2003. $20-$90. Tue-Sat 8 PM; Wed & Sat 2 PM; Sun 2 PM. 2 hrs 15 min. One intermission. Six 1997 Tony Awards includes Best Revival of a Musical. A Fred Ebb, John Kander, Bob Fosse Production; A chorus girl murders her lover.